The basilica of “El Pilar” stands on the right bank of river Ebro. It is one of the most important sanctuaries in the Catholic world. It’s visited by millions of people each year. Specially significant and moving is the event of the flower offering that takes place every year on October 12th. 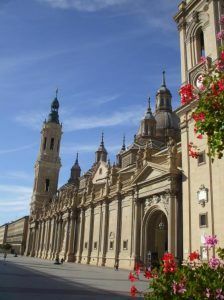 This huge urban shrine located in the downtown area of Zaragoza is a mandatory stop for anyone who visits the city. The towers and domes that shape the exterior view make the basilica recognizable anywhere. The temple that we see today is a jewel of the Aragonese baroque style. According to an ancient tradition, on the night of January 2nd in the year 40 AC “the Virgin Mary arrived in Mortal flesh to Zaragoza in order to comfort Apostle James, as he was preaching the gospel near river Ebro”. She gave him a column as proof of her arrival. The first chapel was erected leaning on this pillar, becoming the first Marian temple in the world. After several consecutive constructions and refurbishes (first chapel, roman temple, gothic-mudejar temple, baroque construction), the building finally gets to the design that can be seen nowadays. The large dimensions of the current baroque temple resemble the great byzantine constructions. It would be master Ventura Rodriguez who gave the basilica the look that it has today by reshaping the plan and adding towers and domes. The basilica is National Monument since 1904. It posses the title of Minor Basilica (there are only four major or papal basilicas and the four of them are in Rome) and the title of Cathedral. 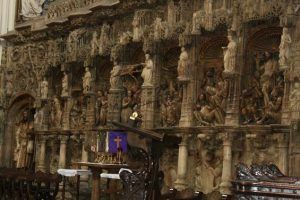 The interior, solemn and of great beauty, has very important pieces of art, such as the plateresque style altar piece of Damiant forment, the Main Choir (set composed by the organ, the ashlar and railing. 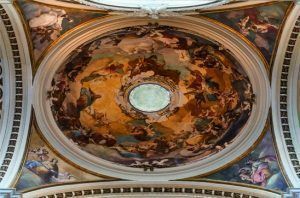 It is one of the most beautiful ones in Spain), or the beautiful dome paintings of the genius painter Francisco de Goya. Another place worth mentioning inside the basilica is the “Humilladero” (Kneeling point). Located behind the Holy Chapel, it is a hole that leaves a piece of column uncovered. The faithful kneel there to kiss it. This very same gesture was made by Pope John Paul II on October 10th 1984. The Holy Chapel represents the heart of the sanctuary. It is a small temple inside the big temple, a sacred area that houses inside the most valued treasure: the image of Virgin of the Pillar. 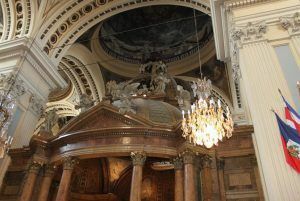 The design belongs to Ventura Rodriguez, who through a baroque with Italian influence conception created an area where the Virgin is the center of the chapel. Inside the Holy Chapel, you can find the “Camarin” of the Virgin. Inside this “camarin” is the image of the Virgin over the Holy Column. The set is finish with great pictures of the painter Antonio Gonzalez. 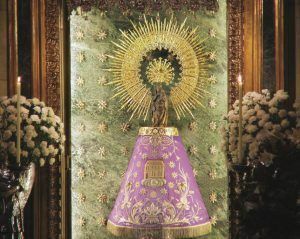 In order to receive the virgin´s blessing, the “infanticos” (word used to name the altar boys of El Pilar) place under her cloak thousands of babies every year. The Pilar Museum, inside the basilica, keeps an excellent representation of the religious art. There you can find magnificent pieces donated to the Virgin by the kings, members of the noble society, religious fraternities… here, you will also find a selection of the best cloaks that the image of the virgin wears every day. The image of Virgin Mary on a column is a golden wood carving statue from the 14th century. It represents Virgin Mary as Queen and Mother. The image is set on top of a column covered in silver of veined marble (67 inches tall a diameter of 9.5 inches). The “pillarists” (faithful to this image) claim that the pillar has never changed its location since the date that the tradition sets the arrival of Virgin Mary. 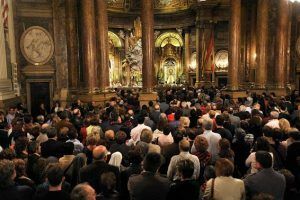 The Virgin of the Pilar, patron saint of the Hispanic people, was one of the first five images to receive the canonical coronation in Spain. 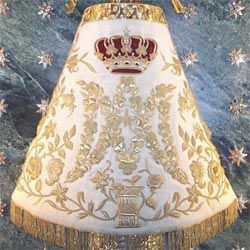 The Cloaks that the image wears each day are something that characterized the Virgin of the Pillar. The cloaks collect the emotions and feelings of the people, their hopes and worries, as well as their gratitude. The objective of those cloaks is to improve the look of the image. The colors used have a meaning: white, for Christmas, Easter and other important days; green, regular days; purple, advent and Lent; blue for Virgin related days; red, for holydays dedicated to the saint Martyrs. Specially significant and moving is the event of ‘The Flower Offering’ that takes place every year on October 12th. On that day, hundreds of thousands arrived from all over Spain and many other countries to bring flowers to the image. All these flowers are placed together forming a big flower cloak for the holly mother. The city streets are filled with emotion and feeling of joy. 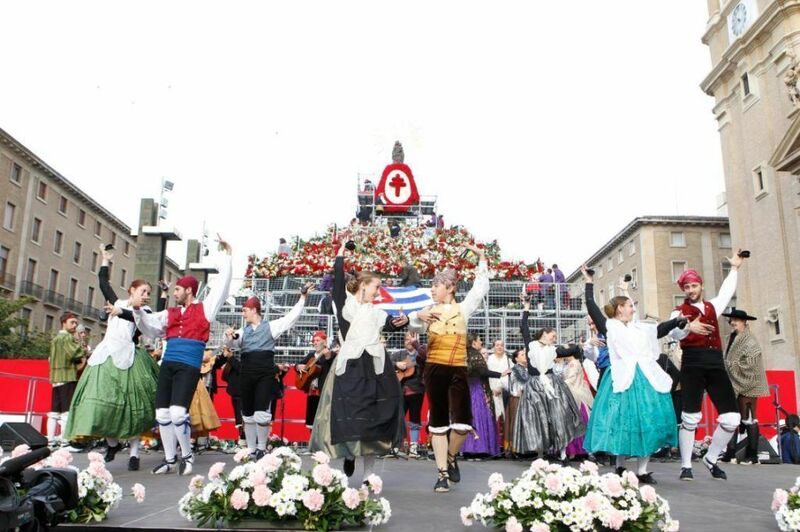 This tradition has been declared by popular vote as a Treasure of the Spanish Intangible Cultural Patrimony. “La adoración del nombre de Dios” (The worship of God´s name) is a fresco of Italian influence and soft modeling. “Regina Martyrum” is however a innovating and imaginative painting, very expressive and one of the most important pieces of Goya. This fresco confirmed him as a great painter. Oddly, he got hard reviews right after finishing it. Week days,morning: 7am, 8am, 9am, 10am, 11am, 12 noon, 1pm and 14pm h.
Week days, afternoon: 17pm, 18pm, 19pm and 20om h.
Sundays & Holidays, morning: 7am, 8am, 9am, 10am, 11am, 12 noon, 13pm and 14pm h.
Sundays & Holidays, afternoon: 17pm, 18pm, 19pm, 20pm and 21pm h.
From 15/april until 15/october: monday-sundays, 10am-14pm and 16pm-20pm h.
From 16/october until 14/april: monday-sundays, 10am-14pm and 16pm-18pm h.
From monday to friday: 13.30pm-14pm h. and 18.30pm-19pm h.
Saturdays: 12.30pm-14pm h. and 16pm-17pm h.
Sandays and holidays: 16pm-18pm h.